When you are getting ready to hit the trail for a long ride, make sure that you saddle up with the Kolpin Matrix Seat Bag. 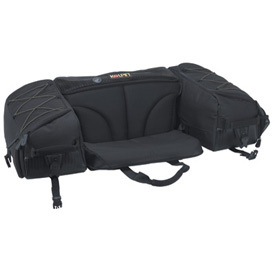 The Kolpin Matrix Seat Bag is great for carrying drinks, food, extra gear ect. keeping the items dry and out of the dust or rain. The padded resting seat is great for when you want to sit back without having to sit on the racks and be uncomfortable. The Kolpin Matrix Seat Bag is easy to strap onto the racks and pull tight for a secure fit. The Kolpin Matrix Seat Bag offers enhanced durability and lots of rugged great features that will be hard to find another seat bag. Kolpin is by your side in sharing your passion for the outdoors no mater where it might take you. This unique design features a built-in padded resting seat for added comfort. Includes two removable gear bags with gusseted wet/dry compartments and water bottle pockets. Center removable cooler features matrix grid interior to securely hold drinks. Water and dirt repellent Hydro Shield exterior and Rhino Armor reinforcement in critical wear areas for extra durability. Web reinforced buckle attachments secure to an ATV rack. This rear rack bag was nice while it lasted. I mainly bought it for the comfort of my passenger. It lasted a year before it broke down and fell apart. The UV exposure i believe is what caused this to break down the most. The bag even acquired a purple tint to it. The passenger backrest is worthless and offers no support. I would spend the extra money and get something more durable. As other reviewers stated, the black bag does fade out to an ugly brown, even if it's stored in a garage. It takes some finagling to fit onto a Polaris rear rack but can be done. The elastic draw strings on the side bags lost it's elasticity after the first season, maybe due to UV rays? The biggest issue with this bag is the zippers. The bag goes on a QUAD, which necessarily means DUST. These zippers will not budge once dusted up on the trail. To help yourself, carry a damp wash cloth in a Ziploc bag to wipe them off when they stick on you, because they will! I haven't tried to carry any ice so haven't experienced leaking, but after 2 seasons it appears to be intact. If you leave your ATV out in the rain, these zippered bags will leak after awhile. If there were a flap over the zipper area, then it might now, but the way it is, your stuff will get wet in a downpour. OKAY FOR THE UPSIDE: The bags are roomy and I like the little pouch for a walkie or cell phone. My little dog loves the padded seat. I like the option of the side bags separating. On a camping or hunting trip, they are easy to remove and take into the tent with you, not having to carry the whole big thing around. Okay, so obviously you have figured out this is a woman writing, in fact, a grandma! I have had 3 new kolpin matrix bags all the plastic liners in the coolers cracked and leaked after a short period of time. Also all the straps dry rot and break after a year and the black color fads to brown with in months even though the bike and bag is completely coverd from the weather . The zippers are horrible when they get a little dust in them. One already broke off. I think I will try another next time I buy. I have had this seat bag on for 2 summers now and the zipper issue started last summer. i was very satisfied with this bag at first but the inner plastic liner for the ice chest rotted and cracked in many places after about 2 months and now the bag ice chest leaks all over the back of my quad and soaks the outside of the bag. I love this bag! Kolpin makes a great products! this bag rocks!!! Excellent storage and the cooler is great for snacks and drinks. Water and mud stay out of the bags and the seat cushion is comfortable. It does fit on a Polaris rear rack but is more difficult to route the straps through the holes. Other than that it I would recommend it. Very good material & seat padding. ice chest works good. very easy to install & remove f/ atv. the best soft pack that i could find on the market!!!! !